You’ll be cool as a cucumber when you try these cucumber sandwiches. The little center you see here are tiny dried rosebuds. I can’t find these anymore so I mix some softened cream cheese and mayonnaise and tint it yellow and pipe center into the flowers. When I was pregnant the first time, we lived in Louisville, Kentucky. I craved this spread they called Benedictine Spread. It was a cucumber spread and you could buy it in cartons already prepared at the grocery. I would eat that for breakfast and lunch some days. Finally I found a recipe and started making it myself. I have all the ingredients ready to make the sandwiches, the cucumber spread, the cut-out bread and the sliced cucumbers. 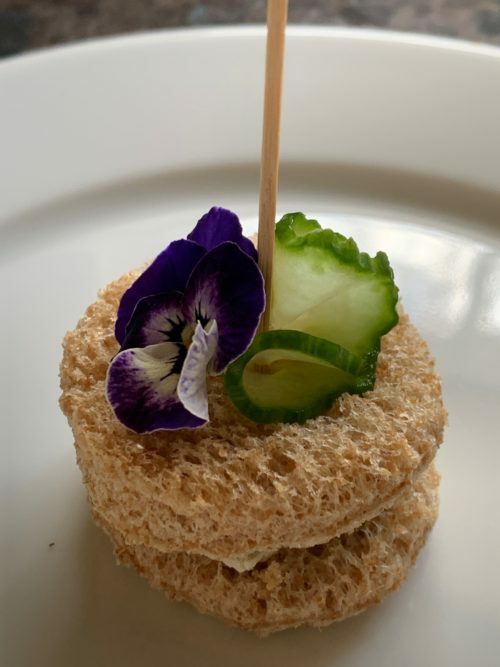 Spread a little cucumber spread on the bottom piece of bread, top with cucumber slice and then the other piece of bread. You can finish off with a little yellow mayo in the center. Take one cucumber, peel, cut in half and scrape out seeds. 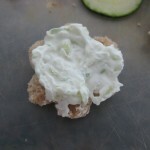 Grate the cucumber and the onion into a piece of cheesecloth and squeeze out moisture. 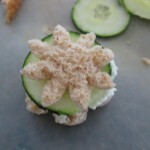 Put the cream cheese, mayo and seasoning into a mixing bowl with the grated cucumber and onion. Mix until well blended. I add a drop or two of green food coloring. Take the other cucumber, cut off each end and then drag a fork down the sides all the way around. I usually use my mandoline and cut these very thin. Now for the ones in the picture, I use a flower cutter for the bottom and a daisy cutter for the top. 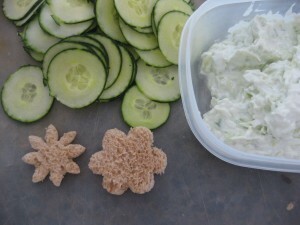 Cut out bread shapes (you can always just do them in rounds). Spread a little of he cucumber spread on one bread slice, top with a cucumber slice and then another bread slice. I sometimes make these one day ahead. If you are going to pipe in a center to the flower, wait and do that right before you serve them.